A few years ago I posted a letter on the internet when I was informed by a fan that Screeching Weasel had reformed. Though the break between me and Ben was complicated, and their is blame on both sides, it was Ben who made the final move to remove me from the band without my consent. There is a complicated relationship between the entity known as Screeching Weasel and the corporation that was known as Weasels Inc. Any twisting of the truth to make it appear as if I willingly stepped down from the band can only be derived from the confusion between the two. I have for the past month been contemplating whether there is a reason to post an explanation, my interpretation of how it went down. I am still undecided. When it all happened, I did not want to add any further to the animosity that had already begun, and instead chose to try and continue my life free of legal battles and mudslinging in order to carry on with my creative life. I imagine that Ben may have been aware of this tendency in me, seeing that in many ways, in regards to the band and the corporation, I was the accountant and he was the lawyer. I had always accounted for things and he made it all sound ethical and skewed to our advantage no matter how ambiguous the details. I do not have the fighter instinct, I do not see with clarity of mind a concrete path, and often this is to my detriment. The aforementioned letter was recently reposted on the Screeching Weasel site for the 27 Year anniversary. Once again I was not asked or even told by the forces that be, and was instead eventually informed by a fan. I submitted a comment to the web post, which after a week so far has not been cleared for posting to the site. We all know that sometimes it is better that the things we write in the moment, while still angry, do not get a chance to see the light of day. I am constantly caught between wanting to engage in a debate and wanting to move on. The gray is a place I am used to, and all too often am comfortable existing within this space of action/non-action. Yet, I can't let it go. This nagging feeling I get when I hear about the band formally known as Screeching Weasel, increasing in stead of subsiding over time, has been difficult, if not impossible, to shrug off. So here is the letter I posted awhile back, which has been reposted on the Weasel Website, and following it is the comment which, as of this time, has not been included. 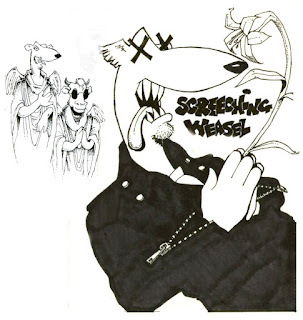 If it weren’t for the fact that I actually enjoy conversing with the fans of my prior bands, I would never have found out about a new band called Screeching Weasel beginning to tour. “This can’t be the band I was in.” I say to myself. “I would have been preparing.” My mind would much prefer going to a place of calm contemplation than into a dark cold room filled with anger and the emotions associated with betrayal. So to avoid painful emoting I first took the facts that Ben and I started a band together called Screeching Weasel, we both spent all our days making that band a home for ourselves, and 18 years later we put it to rest. This along with the statement made by both me and Ben on many occasions that the band wouldn’t be Screeching Weasel without either of us, makes me assume that this band playing isn’t Screeching Weasel, because I don’t recall having kicked myself out of the band. So it seems logical that this is not Screeching Weasel. If it were I would have to admit that I longer have friends named Ben Foster or Dan Schafer. As for people like Ben Weasel, Dan Vapid, or even John Jughead, I have nothing to say, because they never really existed, they were just made up names for a bunch of friends that tried to do something different in order to survive and make a living in this world. And I imagine they are all still trying to make a living somehow, seeing that their band’s prominent “leader” never wanted to tour in order to make it financially viable to continue on. Join Screeching Weasel for two nights of celebration as we ring in our 27th year. Posting this on the site and trying to own it, to, in turn, mock it, in the guise of whatever guise you are trying to create this time from the ashes of your glorious past (perhaps the illusion of band transparency), does not erase the truth of this statement and the hurt that you have imposed on others. ************* I should state that since this "Statement" was originally posted a few years back, Vapid and I, have now come to a place where we are amiable towards each other. Which feels good.